So, it is high time I update my tons of toons. I scanned in a couple of fun images. This is one of them. 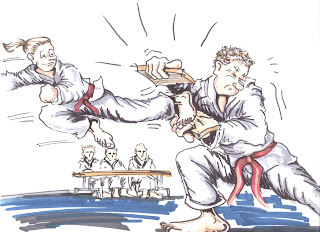 This was drawn about 6 years ago, when Maryn and I were both red belts in tae kwon do. Obviously, this is a portrait of me holding the board while Maryn executes a great running side kick. Yes, it is exciting to jump and kick a board, but is also exciting to be the board holder!!! Fortunately, Maryn's kick was precisely in the middle of the board, and my fingers lived to hold another board!! This image grabs me because of the action, and the shadowing of the primary characters. But it also shows distance by including the masters, who are the ones giving the test. Those are the three guys sitting at the table in the background. These belt tests were always nerve-wracking and exciting, and the board breaks were full of victories and failures. There were countless young students who did not break their board, but would tear-up as their hands or feet would quickly hurt like hell!! The key was to regroup, breathe, think about the technique to get the job done, and DO IT!!! Not so easy when your hand feels like it has been broken into a hundred little pieces.